Katie trained at Withington Hospital, Manchester qualifying in 1982. She then worked for several years in the NHS at the Queen’s Medical Centre, Nottingham and Wythenshawe Hospital Manchester gaining experience in Orthopaedic Surgery, Out-Patient Physiotherapy and Rehabilitation. In 1987 she established her own private practice at 76 Lower Bridge St as well as pioneering the first Out Patient Physiotherapy Clinic at the Grosvenor Nuffield Hospital, Chester. She continued to run the two clinics until 1994 when after her second son was born she decided to concentrate on her original city centre practice. 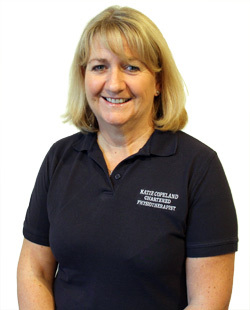 She is extremely proud the clinic has grown in its reputation and from being a sole practitioner now has six other Chartered Physiotherapists working with her. She has always maintained close links with local GP’s, Orthopaedic Consultants and local sports and health clubs and has therefore a lot of experience in treating sports injuries, post operative orthopaedic surgery as well as other acute and chronic musculo-skeletal problems affecting all age groups. Katie often uses acupuncture as part of her treatment and is a member of the Acupuncture Association Of Chartered Physiotherapists (AACP). In 2003 she completed a MSc Double Module at Keele University in Kinetic Control which has continued with a further interest in pilates and is a member of the Australian Physiotherapy and Pilates Institute (APPI). She strongly believes good core muscles, muscle stability training and control of movement is the answer to many musculo-skeletal conditions whether spinal or limb related. She is also a member of the Manipulative Association Of Chartered Physiotherapists (MACP) and the North West Upper Limb interest group run by Shoulder/Upper limb Surgeons and Extended Scope Practitioner physiotherapists. Katie also has links with the University of Chester. She is a guest lecturer for the students studying MSc Psychology and MSc Biomechanics and recently she has developed with the university’s help an Apple iPhone App showing exercises to help mechanical low back pain. Outside of work Katie enjoys sailing, skiing, dog walking, pilates, occasional golf and socialising!